Flying the new Finnair A350 XWB! Two weeks ago, I flew to Helsinki and back in Finnair business class. This was an opportunity to be one of the first people to fly the new Airbus A350 XWB and also to try out Finnair. This article is essentially a primer to the A350. Tomorrow I will look at Finnair’s new A350 business class seating and what the plane is like to fly. Unlike the A380, there is no doubt that the Airbus A350 XWB will be a huge commercial success. You will struggle to avoid them if you are flying long-haul over the next 20 years – there are currently 787 of the planes on order for 41 different airlines, including British Airways. By the end of 2018, Airbus expects to be delivering 10 A350 XWB aircraft per month from its final assembly plant in Toulouse. The plane is the Airbus equivalent of the Boeing 787 Dreamliner. Like the 787, the fuselage and wings are made primarily of carbon-fibre reinforced polymer to reduce weight, reduce maintenance costs and increase cabin pressure and humidity. The aircraft is quieter than its predecessors and emits less nitrogen oxide and CO2. New generation engines, combined with the reduced aircraft weight, lead to substantial fuel savings compared to older aircraft. A wider fuselage than the A330 and A340 aircraft it is replacing – and indeed 12cm wider than a Boeing 787 – means that 10-abreast seating in economy will be possible if airlines choose to intall it. As with the Boeing 787, the Airbus A350 XWB will eventually come in three different models. Whilst Boeing started with the smallest version of the 787 (the 787-8) and is only now starting to launch the mid-size 787-9, Airbus has chosen to launch the medium-sized version first. The A350-900 will typically seat 325 passengers (although Finnair has set them up to seat 297), is 66m long and has a range of 14,000 km. An Ultra Long Range version is under development for launch in 2018 with Singapore Airlines due to be the launch customer. The shorter 60m long A350-800, due to launch next year, will seat 270 passengers with a longer range of 15,400 km. The final variant, the A350-1000, is the longest at 73m and will seat 366 passengers with a range of 15,000 km. It is due in service in 2017 with Qatar Airways again due to be the launch customer. For comparison, the A350-900 is three metres longer than the A340-300 and A330-300 aircraft. The wingspan is almost five metres wider at 64.75m and the cruising speed, at 903 km/h, is 33 km/h faster. And what is it like to fly? If you have flown an Airbus A380, especially on the upper deck, you know that it is a bit of a revelation. The plane is astonishingly large and astonishingly quiet (you honestly do not notice when you take off). With non-premium passengers generally on the lower deck, and with no public access between them, it gives the feeling of flying on an ‘all First / business class’ aircraft. Neither the Boeing 787 or the Airbus A350 offer such a radical experience. To the untrained eye, the only major difference is the larger passenger windows – and even that is not a major change. The improvements in cabin pressure and humidity are less tangible benefits. It feels relatively quiet but it is not as noticeable as on the upper deck of an A380. There are no major changes to, for example, bathroom size. The aircraft is clearly a big step forward in environmental terms but, for the passenger, the difference is less apparent. 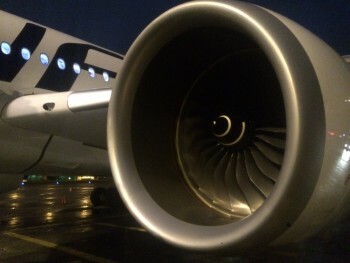 Click here for Part 2 where I will show you what Finnair has chosen to do with its A350s. Excellent article. Brings back memories of my first ever overseas business trip,Business Class, London to Helsinki Autumn 1984, seat 1F on an MD80. I was so far from the engines that take-off was probably as quiet as a 350 or a 380. I also distinctly remember the steward wearing a bow tie and serving after-dinner liqueurs from full sized bottles in crystal glasses. Those were the days. Geek moment: the A350 (iirc a Qatari frame) spent a week at heathrow a few months ago for noise trials. Also the A358 is officially canned. Rumours abound of a stretched ‘A350-1100’. A358 not canned yet, but Airbus are encouraging airlines to switch to the A359 – still a few orders for the shorter one in place, but not enough for it to go into production I expect. Noise is a factor for me, partly why I love the a380 so much. Any noticeable difference between 787 and a350? Probably only on a cessna! Sounds good. 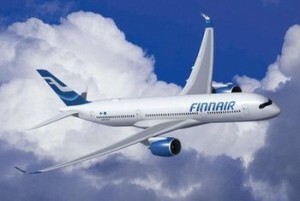 Are Finnair still operating the A350 on any intra-Europe routes? Yes, and this will continue for a while as each new plane requires additional testing. There is a list on the Finnair site. 4 Finnair flights a week to Heathrow will be permanently operated by long haul aircraft, but not necessarily A350, due to the new cargo deal they agreed with IAG. The A350 is a lovely aircraft and I was recently on board one with Qatar airways. Personally I prefer the 787 but there is no doubting that the aircraft is light years ahead of the 747and other older airframes. I don’t subscribe to the A380 view that its radically quieter than other aircraft. It is better than older airframes for sure but what you gain in reduced noise is lost by being among so many other passengers. It biggest problem is the tortuous arrival process as they try to position 3 jetties and this is certainly a problem for BA who took almost 20 minutes to get me off on arrival in HKG. You’re lucky then, it has taken BA (really LHR) more than 30 minutes to get me off an a320 at LHR more than once. Never had a problem embarking or disembarking an a380 in either LHR, SIN, BKK or KUL. IME a380 substantially quieter, and smoother too, than any other aircraft I have ever flown but I have yet to fly a350 or 787? I take it from your comments you flew a380 Y although I guess CW on BA does feel crowded? What did you like better about 787 versus a350 and in which class? Just curious as 787 appears to be most maligned aircraft ever in economy. Upstairs on an Emirates A380 is remarkably quiet at take off, such that I actually thought something was wrong and we hadn’t taken off! But, even on Emirates more spacious business class layout with a whole floor (?) of business and first class passengers it did seem to lose some of that ‘exclusive’ feel. As for BA, on one flight into LHR we waited 40 minutes to get to our stand and depart. Wouldn’t mind so much but the flight was only from GLA, and had actually arrived early! I was on the first A350 from LHR to HEL. Still awaiting a resolution from my wife and son being involuntarily downgraded because someone at Finnair forgot to order the belts for lap infants in business class (but thought they would sell tickets for them anyway!). As I paid with Avios it seems no one wants to know and Finnair customer service has been a total shambles. Nice plane but I won’t be flying it again with Finnair in a hurry (imagine what other safety items they might have scrimped on). You might find it easier pulling hens teeth. I tried to get compensation from them under the EC rules after being delayed at LHR overnight due to the BKK crew turninh up 40 minutes after scheduled departure time, and they subsequently failed to get the toilets pumped out on arriving aircraft prior to BKK departure. By the time claims went in the delays were due to adverse weather conditions so no fault of theirs. I eventually gave up. On flight to London though I was immediately issued €100 duty free vouchers by a flight attendant after she spilled some orange juice down the back of my neck. I was on the same flight but didn’t notice any commotion related to downgrade unless it happened before the flight. Plane was full and a lot of people were surprised by the new aircraft. I flew on the Finnair Airbus A350 in business class almost 2 months ago on its 4th commercial flight! 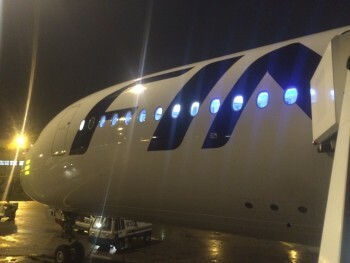 It’s a stunning plane, and I loved the new Finnair cabin & seats as well. I made a Youtube clip with my impressions (+ review): http://youtu.be/Ee7P1hdcssE. Its a much better product as compared to the business class in Finnair’s A330s (which I flew two days ago). Cannot wait until Finnair’s A350s start to fly more Intercontinental routes. Seems very similar to Qatar, however I can see the light upholstery getting very shabby, very quickly. I’m assuming it is just sheer coincidence that 787 Airbus A350 XWBs have been ordered to compete with the Boeing 787? I was on the first HEL-LHR A350 operated by AY in 3A. Thoroughly enjoyed it & was quite, quite sober as had to drive home afterwards. Having done that flight, plus a LAN from MAD to FRA in 1A on a 787 I still prefer the A350. Departure sounded a little noisier, cruise definitely quieter. Just a little disappointing that despite there being a window in the forward loo it was a very snug little box. Come again? Thousands of people have already flown it. QR have been operating it since the beginning of the year. In the context of the billion or so who will fly them during their lifespan ….. I doubt more than a fraction of 1 per cent of HFP readers have flown one given that Finnair is only European customer so far.